This window invites you to Select the Game Setup that you desire. Enter the text you want displayed in your game announcement. After you click on the OK button, your game is announced in the open games section of the current room window. "Game for a nice player" is displayed in the above screen shot. Make your game private so that only you, your opponent and any invited users are allowed to view the game. Display your game request in the Open Games tab. Choose the color you want to play with. Your challenger can propose the color they want to play with. If the game is started with "?" marks in the area for the color selection, the system will automatically nigiri the colors for the players. You can use this area to select who you want to play against (if there are multiple challengers). If the game type is "simul," this section has multiple entries, one for each challenger, and you select who gets to play in the simul game. Pressing the Nigiri Button (the stones beside the player's names) cycles through the possible combinations of colors each player can have. You can 1) set yourself to be Black, 2) set your opponent to be Black, or 3) nigiri for colors. If you opt for nigiri, the system randomly selects the colors for you. Nigiri is the default. Select the rule for the game from one of the following options. 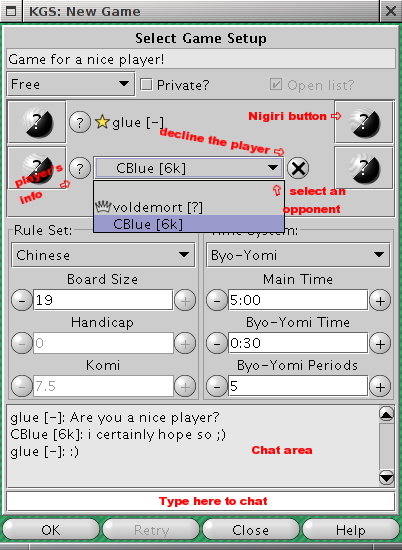 Either player can adjust the "Board Size" (2-38), "Handicap" or the "Komi". Select the time settings from one of the following options. Absolute: Disable all but the "Main Time" options and start a game with an absolute "Main Time" with no Byo-Yomi periods. Byo-Yomi: This option makes all of the other settings available. Select a "main" thinking time; specify the number Byo-Yomi (overtime) periods, and specify their length. This area is visible to any observer or player that is viewing the current "New Game" window. The chat here is not seen in any chat room. The following four buttons are at the bottom of the new-game window. OK: Post the game challenge to the open games list in the current room. When the challenge is accepted, the Game Window is displayed, and the game begins. Retry: Resubmit a game challenge to the other player in the event that the other player refused the game setting that were suggested. Close: Close the new game window. Help: Display this help page. At the beginning of an even game, in a game that is played face-to-face as opposed to on-line, it is customary for the players to draw for the right to select their color. This custom is called nigiri. In on-line go, nigiri means that the system randomly selects the color for you. The New Game window looks slightly different for Rengo and Simul. Background for this page is in the "Setting Up The Game Section" of the Playing Games help page.